Full disclosure demands that I start by revealing that I am also a translator of Scandinavian languages. That’s what led me to pick up this book. In the best of worlds it is possible to read a work from another land without ever thinking about the translator, or the fact that the book was written in a tongue that is not your own. This book does not come from the very best of worlds. Larsson has woven a mystery based on characters. Her situations grow out of the intricate people that have rolled out of her keyboard. The result, in any language, is a book that is complex and demands full attention. No, The Blood Spilt, is not a novel you would take to the beach to amuse you while you gawk at people in bathing suits. It is a dark and often obscure tale of bloody murder that is sometimes—and here we must glance at translator Delargy—awkward. Rhythms and constructions often resemble the original Swedish more than they should. Sentences that do stand as pure English frequently march forward on leaden feet. There are also moments when one longs for the intervention of a stronger editorial hand somewhere in the flow from author to translator to reader. The jacket copy describes the book as a “taut, atmospheric mystery.” It is atmospheric. The author paints every page with bucketsful of details. A character doesn’t only pick up a log to throw on the fire, but rather takes that log out of a wooden box from the Swedish Sugar Company. After a while it begins to feel like that log is part of the too many trees with which Larsson is obscuring the forest. Larsson’s heroine, Attorney Rebecka Martinsson, steps in to pursue brutal murderers and solve brutal murders. Along the way, she stops to combat sexism and comment on philosophy. These are extremely admirable pursuits. Unfortunately, she is burdened down rather than propelled along by her literary creator. On the other hand, the fault may indeed lie with the translator. 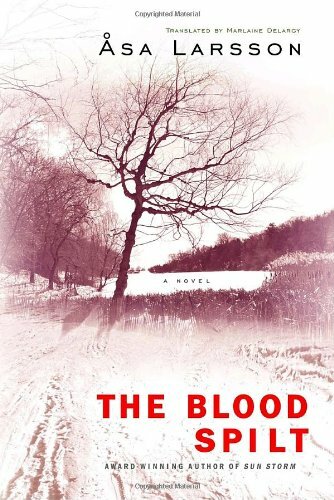 After all, The Blood Spilt was singled out for Sweden’s Best Crime Novel award, and the Swedes do tend to really know what they are talking about when it comes to literature.